Toys that fit nicely into your handbag are complete sanity savers. The only problem I’ve found is that as your children get older, your bag gets smaller. Too often before heading out I’m fumbling about looking for something (anything) that will fit in my bag without the need for toting a trolley. 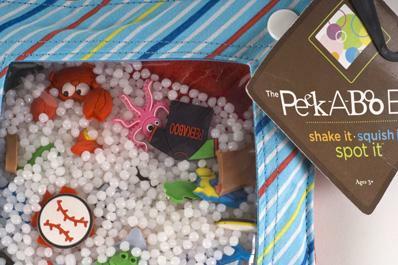 The fact that the Peek-A-Boo Activity Bag is relatively flat won me over at first glance. If that’s not enough, the educational-meets-fun factor definitely backs it up. Each Activity Bag square measures a petite fifteen centimetres and is jammed full of finding fun. Choose from Sugar ‘n’ Spice, Rough ‘n’ Tuff, Everything A – Z or Learn To Read themed Activity Bags. Featuring a soft corduroy fabric on the back and a vinyl window on the other, the Peek-A-Boo Activity Bag is perfect for small hands. Hidden among pearly white beads are twenty-six coloured objects waiting to be found as your child shakes and moves the bag to display its contents in the window. A helpful list of items is handily attached to each bag so you know what to look for! The Peek-A-Boo Activity Bag is priced at $24.99 and available from The Kids Depot. Delivery is available Australia wide.